Eerie sheets and ripples of green hang above a deserted rocky landscape in this spooky Space Science Image of the Week. 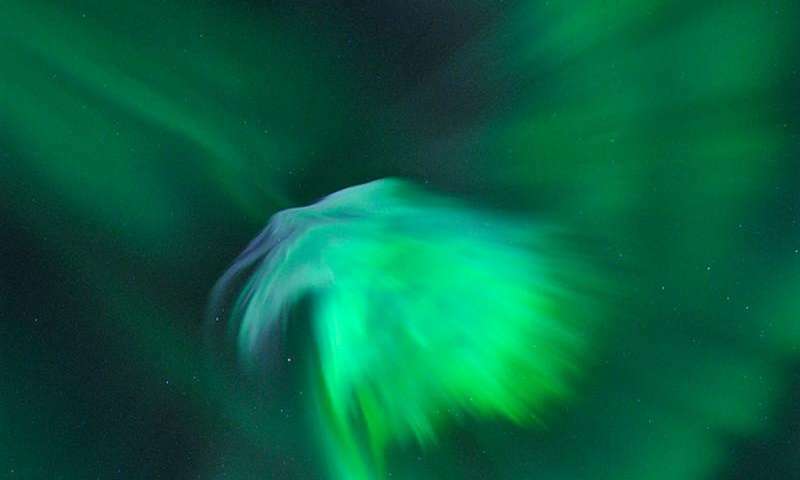 Spikes of neon and emerald seem to form the ominous form of a ghostly celestial eagle, with a sharp beak, bright head and majestic outstretched wings. While this photograph may resemble paranormal happenings or alien activity, the dramatic skyscape shown here is actually due to a much more common astronomical event known as a coronal mass ejection, or CME. This scene was captured on 24 January 2012 above Grotfjord, Norway, by photographer Bjørn Jørgensen. The day before, the Sun flung a burst of high-speed charged particles – electrons, protons and other ions – out into space. Large CMEs can contain up to a billion tonnes of matter, all streaming through space at speeds of up to 2000 km/s. These particles sped towards Earth and some of them became trapped within our planet's magnetosphere, a region of space in which charged particles are contained by Earth's magnetic field. These particles then began to rain down into our atmosphere, smashing into atoms and molecules of oxygen and nitrogen in the process. These collisions release large amounts of energy in the form of light, painting distinctive colours in the sky. The colour depends on the particle hit. The most common colours are the reddish-blue of nitrogen and the red or greenish-yellow hues of atomic and molecular oxygen (as seen here). These colours can mix to produce striking shades of orange, yellow, pink and purple. Because of their speed and particle density, CMEs often trigger stunning auroral displays. When the Sun is particularly active it can produce several CMEs per day, dropping to roughly one every five days at lower activity levels. On average, between one and four CMEs hit Earth each month; these are called "Halo CMEs". A flotilla of spacecraft, including the ESA-led SOHO, Proba-2 and Cluster missions, monitor the Sun and its effects on our home planet. Gawd, the term CME makes me wet.